Buffalo wings, also called hot wings, are a popular dish at many American restaurants. Virtually every restaurant has its own buffalo wing sauce, and they all differ in calories from flavor to flavor. A popular mild-flavored buffalo sauce has 50 calories in a 1-oz. serving. The same restaurant’s medium sauce has 40 calories in 1 oz., and its hot sauce has 50 calories in 1 oz. The mild buffalo wing sauce has 5 g of fat for 45 calories from fat, while the medium and hot sauces both have 4 g of fat for 36 calories from fat in each 1-oz. serving. All of the sauces have 2 g of carbohydrates, giving them approximately 8 calories from carbohydrates; they are also all fat-free foods. 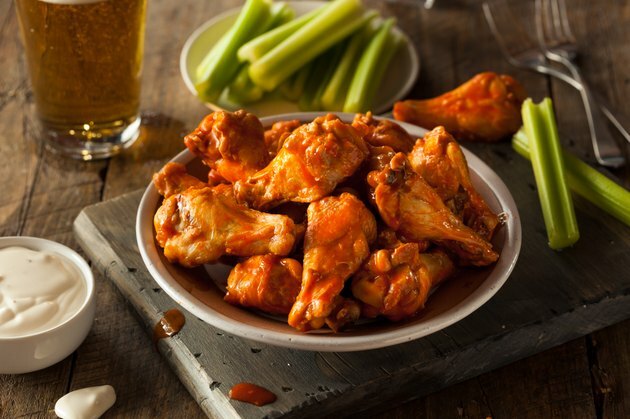 Buffalo wing sauce typically has an extremely high amount of sodium; while sodium doesn’t add calories, it can cause you to retain water to make you feel like you’re gaining weight. The recommended daily intake of sodium for most adults is 2,400 mg. Mild sauce has 1,040 mg in 1 oz., medium has 1,160 mg and hot has 1,200 mg of sodium. How Many Calories Are in Taco Bell Hot Sauce?